Two of my favorite things are cooking with herbs and teaching classes about cooking with herbs. 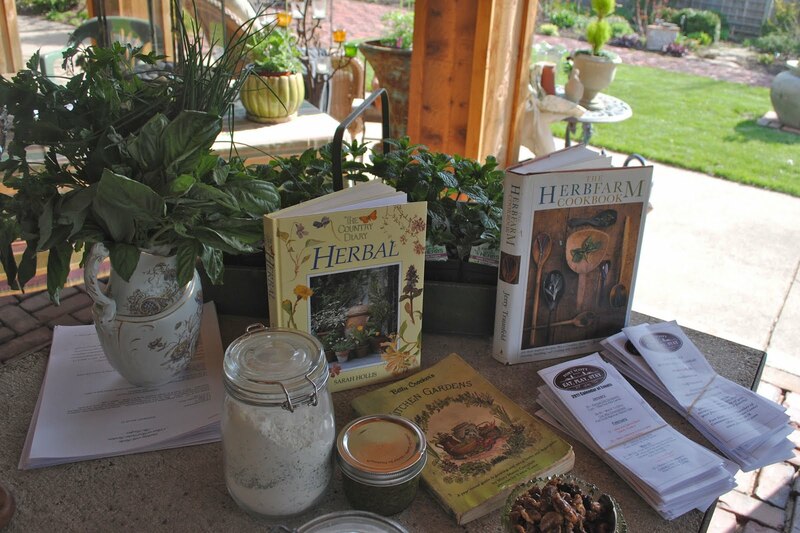 It's a rite of Spring -- herbal cooking classes. It's a way of life at Linderhof -- cooking with herbs. Saturday, friend Shirley Ann and I headed north to Red Cedar Gardens for a class that I was teaching on cooking with herbs . . . and today I will head north again for I'll teach a second class at Red Cedar. Ricki from Red Cedar is a master at tables and the table that she prepared for the class was no exception . 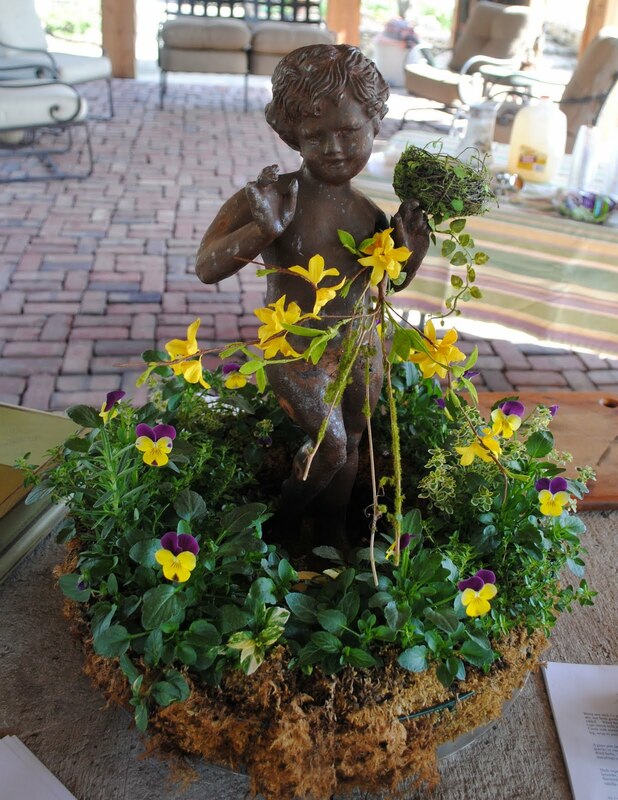 . .
A photo of Linderhof's herb garden . .
Ricki's wonderful thyme and pansy living wreath used as a centerpiece with a nest holding cherub in the middle. It's the same type of wreath that hangs on Linderhof's garden gate -- but Ricki's much nicer than mine! A bit pitcher of fresh herbs (to be used in the class) as well as some of my favorite herb books -- and, of course, some brochures on Fort Scott. We also served Linderhof's chicken salad -- three ways -- plain, with chives and with dill. It's the best way to tell what difference herbs really make. And to sip on, icy glasses of lavender lemonade. It wasn't a sampling -- it was a meal!!! Cooking with herbs is easy -- just take a favorite dish and enhance it's flavor with fresh herbs!!!! 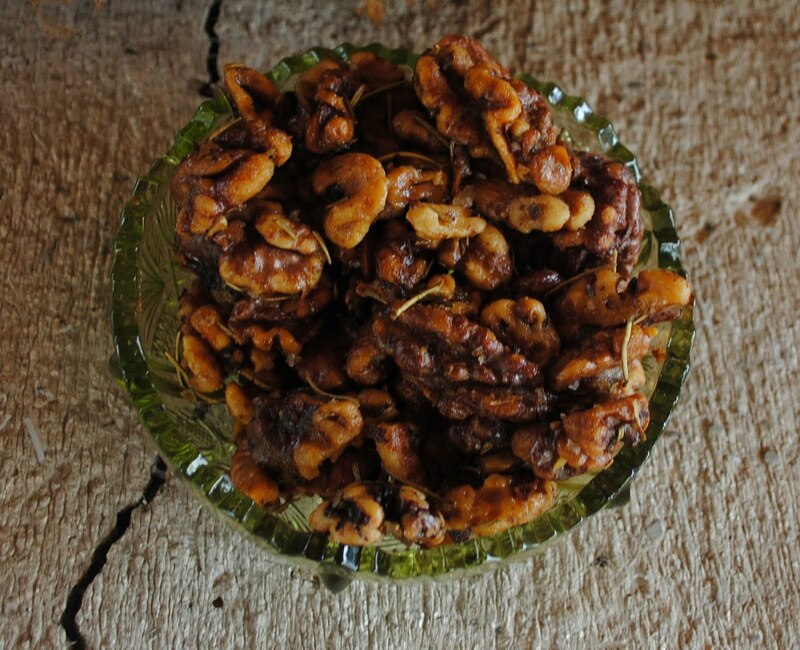 No need for an herbal cookbook. 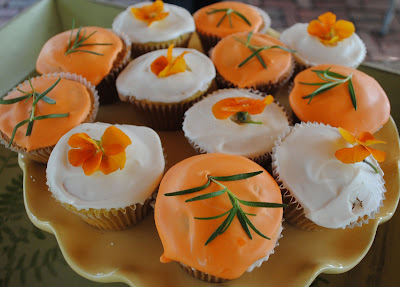 The scones and the fairy cakes were just regular recipes that I added herbs to! It's Saturday and time for Your Favorite Things Saturday and my favorite things are herbs in the garden, herbs in the kitchen, and sharing my love of cooking with them with others! Please join Laurie at Bargain Hunting With Laurie for Favorite Things Saturday! You can find the recipe for the Rosemary Walnuts HERE. Put all of the ingredients (except for the milk) into a food processor and blitz until smooth. Pulse while adding the milk down the funnel to make a smooth dropping consistency. Divide the mixture between 12 muffin tins lined with paper and bake in the oven for 15 to 20 minutes. Cool for a while in the tin on a rack and then remove them from the muffin pan and cool completely on rack. Combine the egg whites and powdered sugar in a medium size bowl and whip with an electric mixer on medium speed until opaque and shiny, about 5 minutes. Whisk in the lemon juice, this will thin out the icing. Beat for another ocuple of minutes until you reach the right spreading consistency for the fairy cakes. Mix. Knead slightly, roll to 1/2 inch thickness and cut into 2 inch rounds. Bake on ungreased pan at 425 for 10 to 12 minutes. NOTE: You can use 1 1/2 c. of herbed flour and omit adding the fresh herbs. The only herb that remains in our garden is thyme and it's doing well. The rest will be slower in coming but most welcome when they arrive. I'd love to take your class. The setting is wonderful. Those tables were lovely, indeed. By clicking on the photo it came up computer full screen size...how delightful! I adored seeing the photo of Linderhof's Herb Garden! We'll be going herb shopping this weekend for those herbs that didn't winter over. I am so ready to have fresh herbs in my recipes! Thank you for sharing your class with me in 2001! It has enriched my cooking experience! This looks like such a fun class, Martha! And how is this for a classroom?!! Beautiful! Thank you for the recipes....I want to make those fairy cakes! You have recharged my herb-batteries, Martha. Now I can't wait for my herbs to come back so I can use them in new ways! I'm a big fan of traditional Shaker recipes, and using herbs well is one of the focal points of that cuisine. Martha I used to take cooking classes occasionally and I can see that yours would be a great experience. Thank you for including these delish recipes. Herbs make the difference! Beautiful presentation... loved the photos! I so enjoyed my visit to Red Cedar Gardens today, what a wonderful place to have your classroom. 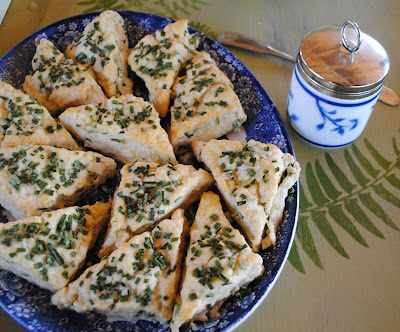 I shall be trying the chive scone recipe soon, miraculously last summers pot of chives survived the winter snow and is thriving well. it all sounds wonderful! I love using fresh herbs as much as I can. I love dill in chicken salad! Wish I lived closer...I'm sure your classes are amazing! I was scrolling down - hoping the recipe would be there! Oh goodie! Are you kidding? herbed flour? never heard of such a thing. I won't use it of course.... it is like self raising flour...I always ask, why? .... what's the big deal of adding your own herbs...or your own baking powder? 2 extra seconds, if that. I guess I just don't get it.